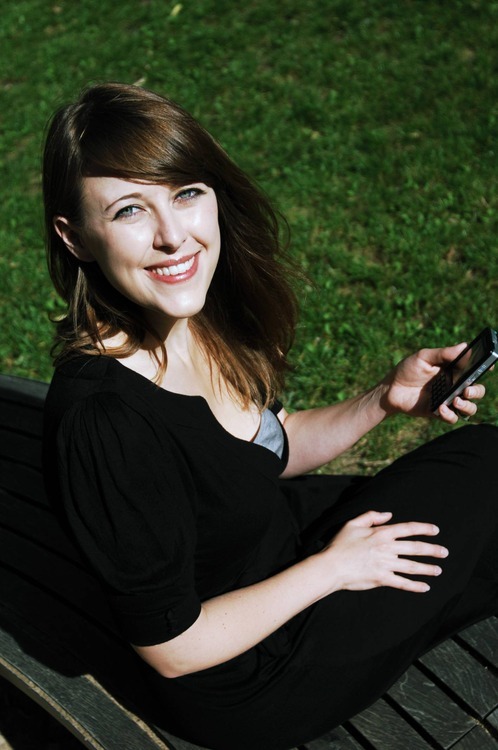 Meet Stefanie Hoffmann, Cofounder of loui Apps. I started my career in a German publishing house called Bertelsmann, where I worked as a product manager for over 7 years. The selling of content was the first contact I had with technology and the world of Internet. Since I first came to Berlin in 16, I always wanted to come back and live here. When I had the chance I was starting to study communications strategy and audio visual communication at the University of Arts here in Berlin. I was exploring the art of animated film, writing, and various communication strategies. It was there I met my founding team of what became aka-aki, originally our diploma project. We used a lot of the techniques we learned from our studies in movie making and strategy when designing the product. For example, we first made a video clip that described the product and than we started developing it. We wanted to create a virtual layer over reality. The problem we were trying to solve with it was how to meet interesting new people nearby and stay in touch with them through messaging. The idea of a mobile location-based social network was born. The press picked it up very quickly because the issue was trending. From Spiegel Online to Michael Arrington, London Times and Le Monde the tech world was writing about us. So how did you meet your Loui apps cofounder Gabriel? Gabriel Palomino and I have been very active in the mobile startup scene for 6 years now. The mobile startup scene is a very small world and we both were attending most of the same conferences around Europe. I guess sooner or later something like destiny brought us together. We met in one of those conferences. I was CEO of aka-aki and Gabriel was living in London. After some time we started working together and so far, we’ve been quite productive. We are a good tandem. How did the idea of Gabi come about? We were thinking about how to experience social networks in a different way, giving more control to the user, and offering new ways to interact with it. The vision of Siri and Facebook integrating inspired us a lot. We started imagining how you could ask Siri about Facebook topics. We are fans of simple and easy apps so design and interaction were other aspects we wanted to improve in our approach. This is how we came up with Gabi. It was about how to see what’s relevant instead of the whole feed, and how to manage social networks in an intuitive way. Gabi answers almost every Facebook topic you can imagine, from “Which are the best pictures or the most commented-on statuses” to “Who are my single girl friends?” The way the user interacts with it is like a children’s game. You just have to tap and build the question. The rest of the magic is done by Gabi. It connects directly to Facebook and collects the right information to show you. The app is able to show you only what you were asking, sorted and filtered depending on your interests and preferences and what is relevant for you. All the content always is fresh because it is collecting what is available from Facebook. I am in the role of director. My main responsibilities are art direction and design/concept. So what’s next for Loui Apps? What are your plans for the future? Do you go beyond Facebook? Do you go onto different social media platforms like Twitter? We get tons of feedback asking those questions through email and Twitter. People are very active in telling us what would be cool to have next in the app. Right now we are going through all of this feedback. We design always in relation of what the users wants next, and there are some clear tendencies developing among their requests. Some of the new features are related to new ways of sorting your feed, which takes into account values other than likes and comments. Additonally, there will be a lot of great features coming out on iOS 6. In a near future we also will teach Gabi to talk to other social networks like Twitter and Instagram. We are a very small team so we will do it step by step, calmy, and always with the user in mind. In general now, what advice would you give to Berlin women who want to join a startup or create their own like yourself? Software is not only about technology. There are important aspects like interaction and making apps social. People want to have exciting experiences. They want to be fascinated when they open a new product. The next step for tech is getting closer to the user. When people think about tech companies they are often thinking only in code, programming and complex things they don’t understand. I think that fear has to be removed. It is time to think about tech companies as if they were restaurants. If you offer the plates that users want you have it. Just like in a restaurant the right team is critical; to find a good developer, architect, designer will be difficult, like if you have a restaurant and you want to find a good chef. For more on Stefanie, please visit her Friday@6 profile here.